Not the weather we hoped for. Sketching outdoors is out - as winter weather lingers for at least one more weekend. However Urban Sketchers love the Met. A unique show will make this visit a winner. 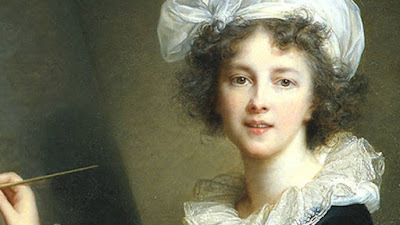 Vigée Le Brun - one of the finest painters of the 18th century is featured in her first retrospective. Eighty incredible works including paintings and pastels never seen in public. Click to see the video to learn about her life and times. Show and Tell: 3:15 off to Carlow East at 1254 Lexington Ave, b/t 84th St & 85th St to share drawings, good stories and a beer or wine if you're so inclined. Pay what you wish, despite what the signs say. Be generous if you can. Rules about sketching are unevenly enforced, mostly they don't want you to block traffic. Pencil is always okay. Waterbrush and watercolor are often tolerated. They don't want open water. Bring a stool. Most times they're okay to use. Guards will search your bags as you enter. Backpacks are not welcomed but a shoulder bag is fine. It's also easier and quicker to check your coat at the 81st Street entrance and there is a convenient bathroom there.